The French have a saying, “You must watch what you’re cooking like milk on the stove,” referring, of course, to the fact that milk can boil over in a flash. Case in point: Garlic chips are sweet and nutty when cooked just right, but let them go just a little too long, and they become burnt and acrid. A chapa is a flat piece of cast iron set over a fire. Alternatively, you can use a cast-iron skillet or griddle placed over a barbecue grate, which is in turn placed over a wood, charcoal, or gas fire. 1. Pour the vinegar into a small bowl and whisk in 5 tablespoons of the extra virgin olive oil. Season to taste with salt and pepper. Set aside. 2. Using a small slicer or a mandoline, slice the garlic very thin. 4. Cut the carrots crosswise in half, then cut the halves into thick rough sticks. Toss in a bowl with 3 tablespoons of the olive oil, the thyme, and salt and pepper to taste. 5. 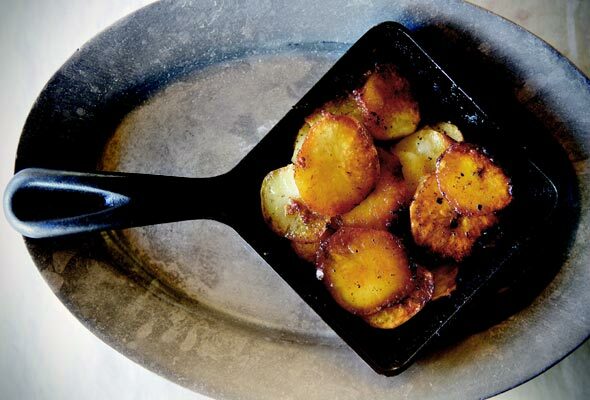 Heat a chapa or large cast-iron skillet over high heat. Working in batches if necessary, add the carrots in a single layer and cook, without turning, until they are charred on the bottom and almost burned, 3 to 5 minutes. Turn with a spatula and cook on the other side for 2 to 3 minutes more, adjusting the heat as necessary, until they are charred and crunchy on the outside and tender within. Transfer to a tray. Wipe out the skillet, if using, and set aside. 6. Combine the parsley and arugula on a large serving platter and toss lightly with half the vinaigrette. 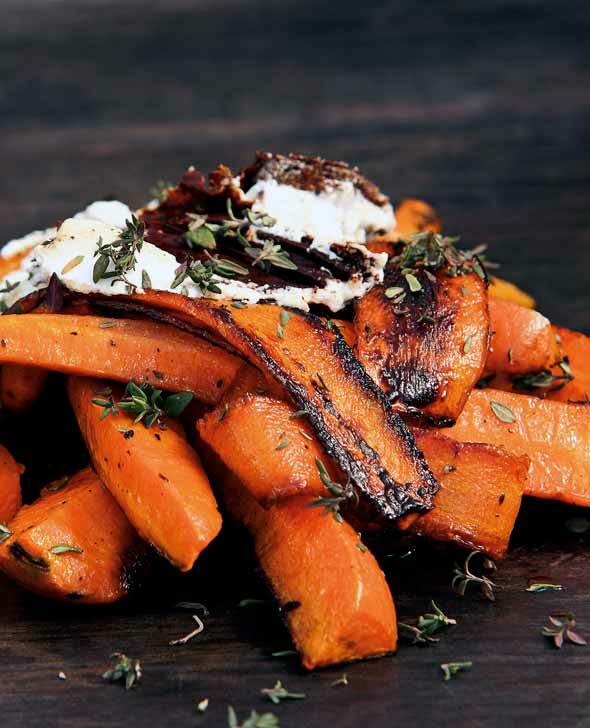 Place the charred carrots on top. 7. Reheat the chapa or skillet to very high heat and coat with the remaining 1 to 2 tablespoons olive oil. Immediately add the slices of goat cheese: be careful—the oil may spatter. As soon as you see the cheese blacken on the bottom, remove the slices with a thin spatula and invert onto the charred carrots. Toss the garlic chips over the salad and drizzle with the remaining vinaigrette. Layers of complex flavors make this salad unique: naturally sweet carrots contrast with pungent garlic, tangy goat cheese, and muddy, peppery arugula. It may be an acquired taste for some palates, but I found it pleasant and earthy. Choose the best fresh carrots you can find–bright colored, very firm, and crisp. This is not the recipe for using up those old carrots in the bottom of your fridge that have begun to dry out and crack like weathered skin. Timing is everything, so pay attention when frying the garlic to a “golden” brown. Garlic becomes bitter when overcooked, which could ruin the dish. I chose elephant garlic for its milder flavor. The larger chips made a very nice presentation. Although milder than regular garlic, it can still turn bitter. Overall, I enjoyed this deviation from traditional salads. The combination of slightly bitter greens, sweet charred carrots, and earthy goat cheese i held together well with the simple oil and vinegar dressing. A scattering of crispy, nutty garlic bits tops things off very nicely. Don’t fear; although the carrots are burnt, they are also very flavourful, but you do need to keep a close eye on them so they don’t become charcoal sticks. Bûcheron wasn’t available, so I used a soft goat cheese (not runny) with very good results. I opted for the cast iron pan method of preparation with very good results. Since there’s a lot of smoke generated doing two batches of carrots, this is best prepared outside. I served this alongside grilled rib steaks… what a combo! NOTE: Unless you want garlic scented oil around, you can safely reduce the amount of olive oil for sautéing the garlic chips to 1/4 or 1/2 cup. If you look at the amount of carrots used in the recipe (1 1/4 pounds or 20 ounces), it figures that you would get about 2 1/2 ounces of carrots each. That’s not much, and the amount of salad greens doesn’t add a lot more to the mix. I think the number of servings should be 4. 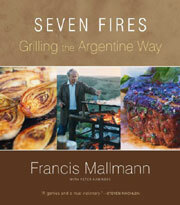 Burnt Carrots, Goat Cheese, and Garlic Chips Recipe © 2009 Francis Mallmann. Photo © 2009 Santiago Soto Monilor. All rights reserved. All recipes and photos used with permission of the publisher. This is an unusual and somewhat, shall I say, enchanting way to enjoy carrots. Just be careful with the molten goat cheese.